Bofli has two Orange County stores--Costa Mesa and Mission Viejo-- that also offer 24-hour access mailbox rentals, notary, and copy services along with FedEx, DHL, and USPS shipping capability. Plus, they’ll save you time and money during the holidays, you won’t need to wrap a gift, when you use an impressive Boxfli box. You can customize a box or choose from their wide array of colors, sizes and designs. Boxfli can help you with all of your packaging and shipping needs. Open 9 a.m. to 6 pm. Monday to Friday. 10 a.m. to 4 p.m. Saturday. 1904 Harbor Blvd. in Costa Mesa. 949.642.4269. 23981 Alicia Pkwy., in Mission Viejo. 949.595.0424. Still deciding on Thanksgiving dinner plans? 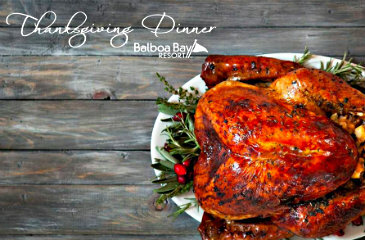 At one of the area’s best restaurants for dining and views, the Waterline at Balboa Bay Resort in Newport Beach you can experience a memorable Thanksgiving dinner prepared by Executive Chef Vincent Lesage, Chef des Cuisines Rachel Haggstrom and Pastry Chef Brooke Martin on the waterfront from 2 to 7 p.m. The menu offers four delicious courses, starting with family style house corn bread, maple butter, and butternut squash soup, hazelnut cream, pain d’epice. The second course is a pumpkin spice cured salmon with cucumber, radishes, and watercress. The third course, is a citrus marinated turkey breast, oyster stuffing, and cream of mushroom, turkey jus; or filet of beef, bone marrow condiment, potato dauphinoise, green bean and cranberry gastrique; or buttermilk bread crusted sea bass, turkey jus, spelt risotto, baby kale. Dessert is a sweet potato cake, cranberry coulis, spice tuile, crème fraiche ice cream; or pecan bar, coffee cremeux, milk chocolate mousse, and salted caramel. Adults cost $85 and children cost $42. Waterline is at the 1221 West Coast Hwy, Newport Beach. 949.630.4285.